Inspired by a Book for the #31DC2016Weekly - Polish Etc. 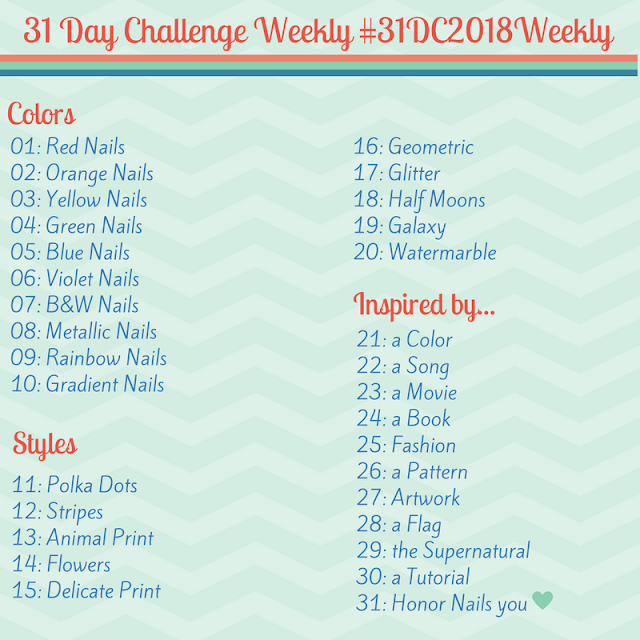 Late again with the challenge post this week! I am sorry. But you can forgive me, right? This week we are doing nail art inspired by a book. Last year, I didn't even make it this far into the challenge. But this was the book I would have chosen. We all love George R. R. Martin's epic series, A Song of Ice and Fire. I read the first book in the series, A Game of Thrones, last year after being completely addicted to the television series. You must have been living under a rock for the past 5 years if you haven't heard of this show. But the books are so amazing and totally worth the read. 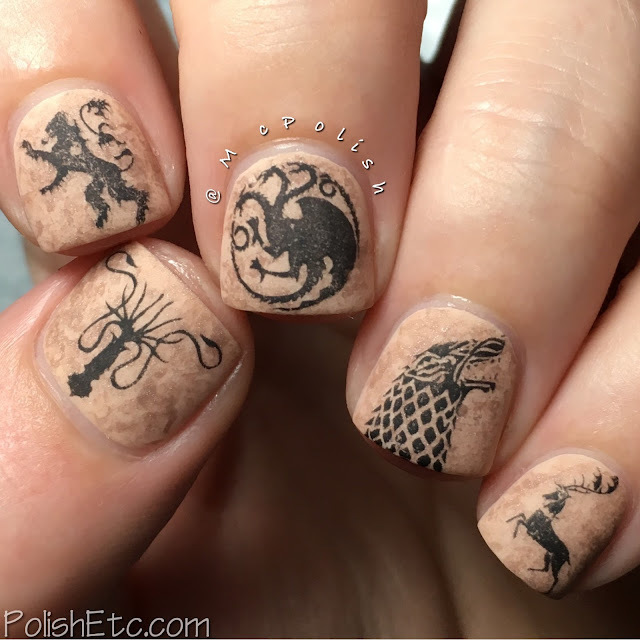 I just finished the second book in the series, A Clash of Kings, this weekend and just could not stop myself from doing nails inspired by it. A Clash of Kings is all about the war of the 5 kings and all of the major houses in Westeros fighting for the crown. I used a set of nail water decals that I have had for a few years for this look. They are the depiction of 5 major houses sigils. House Stark is a dire wolf's head. 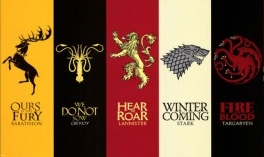 House Lannister is a roaring lion. House Targaryen is a three headed dragon. House Baratheon is a stag. And House Greyjoy is a giant kraken. I have each of these sigils on my five nails. The background is a base of Zoya "Chantal" with butter London "All Hail the Queen" dabbed on top with a crumpled piece of plastic wrap. I like it both with a glossy and matte top coat but the matte version just looks so cool. It looks like the sigils were burnt into sparkling sandstone. Love it! 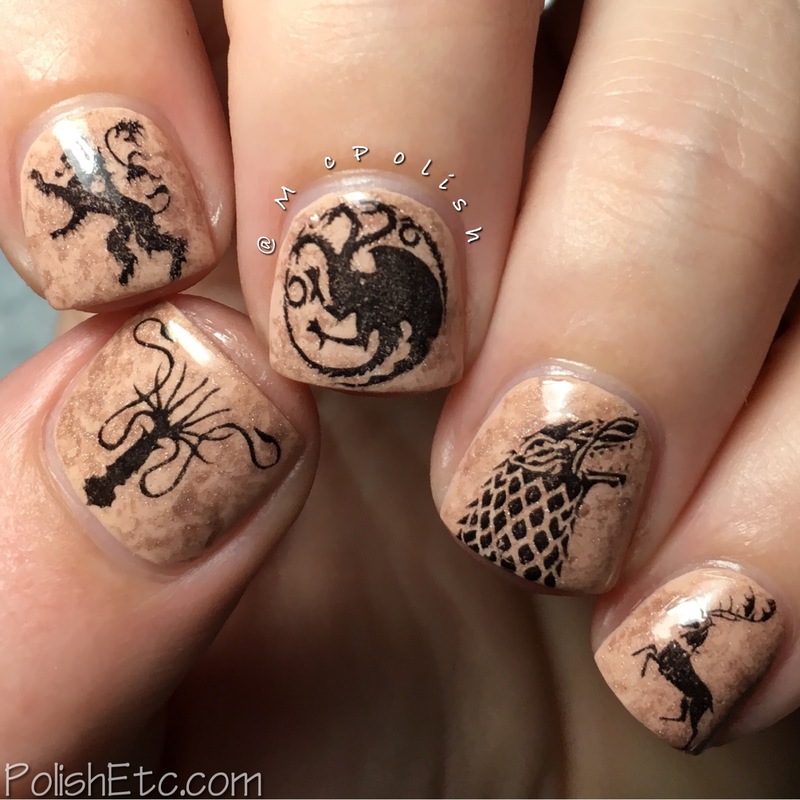 Why it has taken me so long to use these decals and do some Game of Throne inspired nails is beyond me. I do not believe the indie shop that made these decal is still open. I got these as a gift from Indie500Nails a few years ago. But you can stalk their Etsy shop and see if they come back (Tentacle Studios). I love how this manicure turned out. Do you? And tell me your favorite character in the series (book or show). Duuuuuuude! You need to read or watch this. It is amazing. I've read all the books and I'm just waiting with bated breath for the next one!